Our mission is to make teaching and learning easier. To do this, we work with schools and districts to differentiate instruction through student centered practices that focus on critical thinking. We use use free commonly available web-based technology. We put learning first, technology second, and believe that the teacher – not the technology – is the greatest influence on learning. Our process is collaborative. We will work with you to identify desired outcomes and then design the professional development program to make it happen. Click on the services below to learn more. For pricing, scheduling and questions, contact us. Our unique Writing Program teaches students how to analyze text and organize ideas in a brand new way – visually and non-linearly. For many students, the result is a better way to read, organize ideas and write. Data support these assertions. 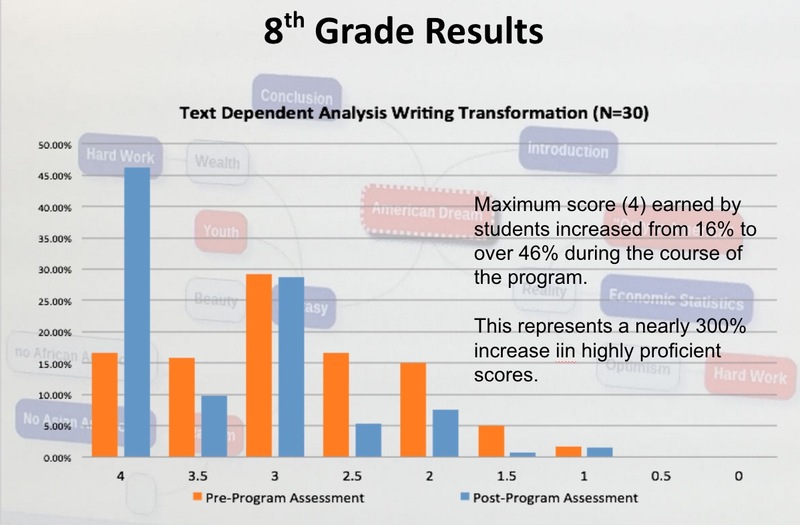 Our preliminary research showed a 20% improvement in PARCC style writing prompts resulting from our Visual Leap® Writing Program for Middle School. The skills are easy to acquire because they match how people naturally think, organize ideas, and write. This program is specifically designed to improve constructed response writing and text dependent analysis writing. The skills and methods learned, however, are broadly applicable in the classroom and independent learning. 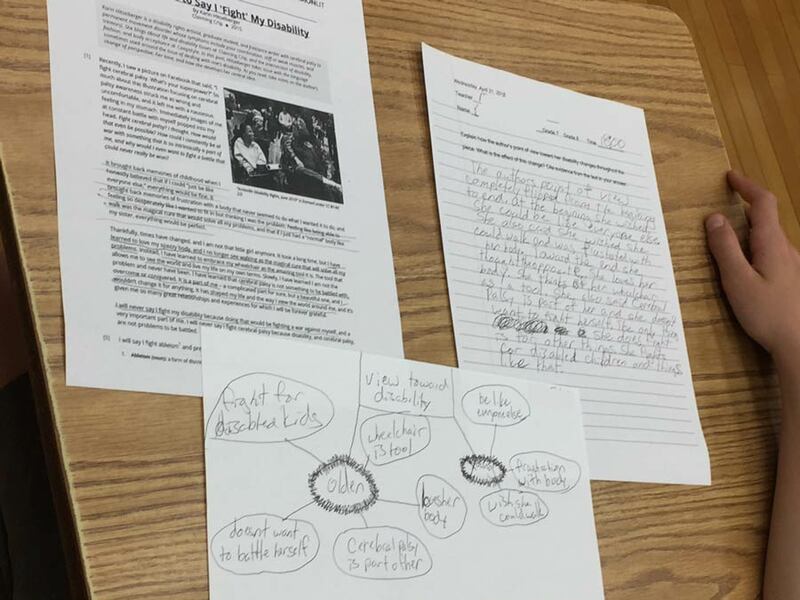 Writing Programs are conducted at schools by Visual Leap coaches. Each program consists of eight total sessions and six instructional sessions. Session are 1-hour and are conducted once a week over a eight week period. We work during the school day – directly with your students and their teachers. This close collaboration is essential. Teachers must be co-learners with students and the Visual Leap coach. The purpose of this collaborative job-embedded coaching model is so that teachers fully experience the training, along with students, and are able to continue to integrate these instructional strategies confidently after the program is over. During the program teachers are essential with with instruction, reflection, evaluation and classroom management. The Writing Program cost is based on full-day engagements with schools, one day a week over an eight week period. The full-day model allows for large numbers of students and teachers to be trained. It also reduces travel related expenses. Each Writing Program investment allows four (4) instructional sessions per day. The details of delivery often vary from school to school. For instance, sessions can be delivered one class at a time in their classroom, or one grade at a time, delivered in an auditorium. For large schools with many sections of each grade, we can work with combined classes in suitable spaces. We can also use instructional days to work with different grade levels. Together we will design the best delivery option for your school that offers the most impact and value. Program cost is $12,000. 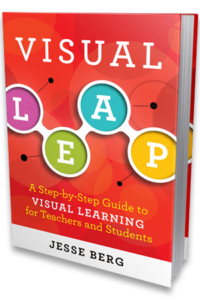 This includes eight full days of on-sight work at your school and copies of Visual Leap: A Step-by-Step Guide to Visual Learning for Teachers and Students for participating teachers and instructional leaders. Contact us for booking or with questions. Our promise is to maximize the use and impact of instructional technology by helping teachers to engage and empower all students. We specialize in differentiated instruction, Computing in the Cloud, 21st Century Skills, and Universal Design for Learning. Programs can range from one hour to multi-day engagements.We can flexibly combine content as needed. Often we can create custom workshops to fit your instructional objectives. Whether your teachers work with iPads, ChromeBooks, Interactive Whiteboards or PC/Mac laptops, we will help your teachers use their tools with purpose and confidence. Exact cost of workshops will depend on the agenda, travel. Half day workshops cost approximately $1200 plus travel expenses. Several of our most popular workshops are listed below. The “Grand Slam of Visual Learning” workshop provides an essential introduction to the classroom methods presented in the book. It empowers teachers to naturally differentiate instruction and will unlock the minds of many of your most challenging students. The Grand Slam targets improvement in writing, critical thinking and organization of ideas across the academic spectrum. As students master the Grand Slam, they will become confident, independent thinkers and lifelong learners. This workshop applies our core methodology to a broad array of critical learning skills. 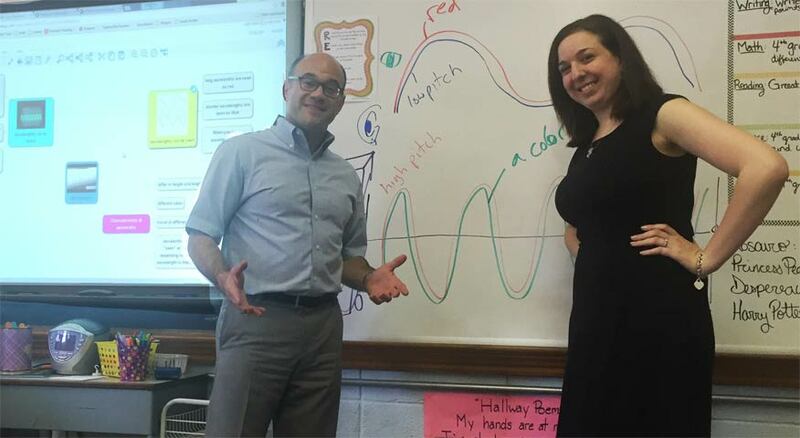 All students will benefit, and your most non-linear, visual thinking non-traditional learners will reap outsized benefits from these methods that your teachers will bring to their classrooms. Your teachers will be amazed by how simple it can be to create a rich student centered class that engages all students in critical thinking. This core visual thinking workshop teaches learners to organize ideas visually, boost critical thinking and improve writing. This workshop is built on foundation of Blooms Taxonomy. It seamlessly guides students from lower to higher order thinking. Summary Man workshop participants will improve writing, analysis and reading comprehension. The Reverse Mind Map is a variation of the Webstorm workshop. In this workshop, learning is student centered and the teacher facilitates discovery and student dialogue. Students often resist pre-writing and pre-reading exercises. Constructed Response Magic is a workshop that develops students’ ability to independently create their own graphic organizers to guide their reading and writing. Teaching purposefully, with technology, is our passion. Our instructional technology workshops help teachers maximize creativity and collaboration. We emphasizes the use of technology to differentiate instruction and break down barriers to learning. Our goal is for teachers to gain the confidence and clarity to effectively use the Web and their devices to redefine how they educate in the Digital world. Gain simple, powerful ways to help students foster deep understanding of mathematical concepts, represent concepts visually and strengthen mathematical dialogue and reasoning. Using iPads, ChromeBooks, laptops, or virtually any device and Common Core Standards as a framework, we will use our favorite virtual manipulatives from Math Learning Center and others, such as number lines, fraction tiles, base-ten blocks and geoboards to engage and achieve in math. We love A-ha! moments that flourish when we visualize math into crystal clear concepts. The Google suite of apps and tools, known as GAFE, may be the single most powerful set of FREE tools that a school can embrace to differentiate instruction (through Apps and Extensions) and achieve the 4 C’s of Education: Creativity, Critical Thinking, Collaboration and Communication. 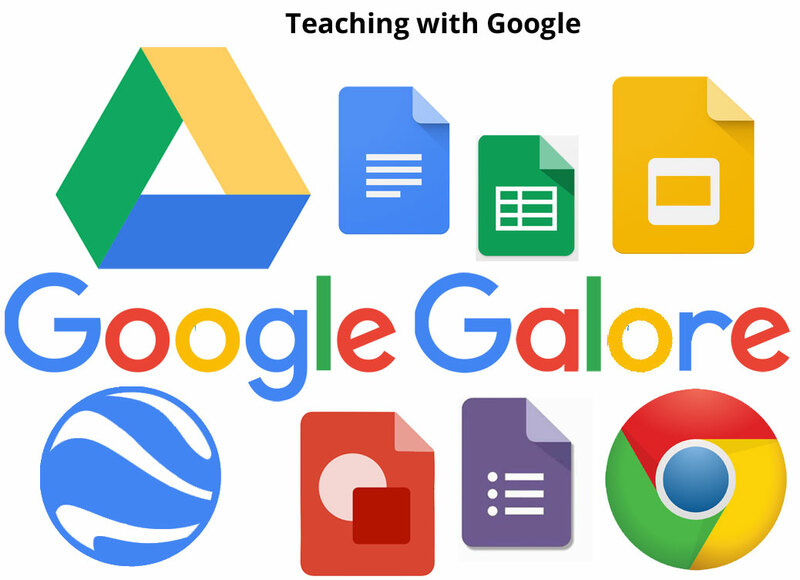 Our workshops focusing on Google tools bring these lofty principals down to earth in simple ways that are easy for teachers to implement and build upon. Job-embedded coaching is a proven and rewarding model for transforming teaching practice. Visual Leap job-embedded coaching emphasizes a 1:1 collaboration between teacher and instructional coach. It includes co-teaching, lesson modeling, lesson co-planning, classroom visitation, reflection and debriefing. With this model, coach and teacher pairs delve deeply into the curriculum, meeting student needs and adapting based on student data. Using an action research approach, the coaching process yields outsized results for teachers and students. Areas we often focus on include technology integration, Google Apps for Education (GAFE), critical thinking and advanced questioning methods, differentiating instruction and project based learning. We use a job-embedded model based on Instructional Coaching: A Partnership Approach to Improving Instruction by Jim Knight. In general, schools engage us for five day coaching packages. We typically come to your school and work with a cohort of four to five teachers throughout the day, once a week for five weeks. Cost of a 5 day coaching package is $6000 plus travel expenses. Discounts for multiple packages are possible. Contact us to book coaching and with questions. Our blended professional learning programs is called “The Square Deal.” It combines the practicality and value of our 24/7 learning portal with real human relationships, classroom support, training and technical assistance. Pricing depends on the number of schools that you wish to provide The Square Deal. Contact us for pricing and with questions. 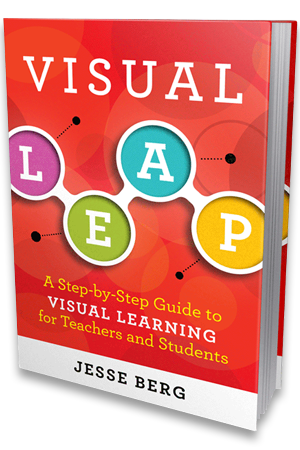 The theory and methodology of the Visual Leap book. Jesse Berg is an accomplished, knowledgeable speaker able to inspire an audience of teachers, administrators, parents, and visual learners. Berg, a visual learner, parent, and educator, offers his unique perspective on various aspects of education, technology, and the brain. Combining stories, science and mixed media, Berg’s keynotes are engaging and informative. Contact us for booking and with questions. Sometimes schools need our help at critical junctures to understand their strengths and weaknesses and how best to move forward in support of student learning. This can happen during accreditation or re-accreditation, at school or district leadership change, timed with budgets, or as part of an annual reflection process. Visual Leap expertise in technology planning and implementation, differentiated instruction, teacher professional development, student assessment, and graphic presentation of data are critical factors to success in these engagements. 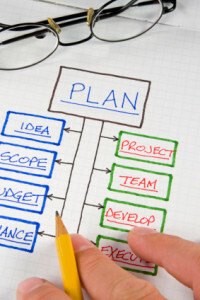 Visual Leap consulting services include technology assessments, professional development program design and implementation and graphic facilitation to visualize strategic planning and other complex processes. Please contact us to discuss how we can work together to support your students and teachers.